In 1729 eighteen singing men of the parish clubbed together to build a choir gallery in the parish church of St Lawrence, Gnosall, Staffordshire. The gallery or loft was situated next to the pulpit, rather than at the rear of the church. That the Loft in the Church of Gnosall by the Pulpit was by the Minister and church-wardens appointed for the use of certain Persons to sing Psalms there. That it was fitted for that use at the expence of Thomas Fowke, John Stevenson, John Hicken, John Collier, William Collier, Thomas Ward, William Adderley, John Chilton, Humphrey Bayley, Thomas Sutton, Nathaniel Sutton, William Bromley, William Venables, John Parkes, John Lees, Adden Ashton, Richard Bernard, and William Reynolds, and that they are to enjoy the said Loft during their continuance to sing Psalms to demean themselves well. That the expence in fitting the said Loft for that purpose did amount to the sum of one pound and sixteen shillings. That four pence a year shall be allowed by every one of the above-named Persons for his sitting in the said Loft till the said sum of one pound and sixteen shillings shall be discharged. 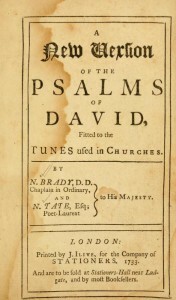 That if any one of those Persons who are appointed to sit there shall leave his place, another Person, who can Sing Psalms shall be nominated by the Minister and Church-wardens of Gnosall to succeed him and that he who is nominated to succeed him shall pay to him, that resigns his place or Sitting, the eighteenth part of that which shall then be unpaid of the one pound and sixteen shillings. Robert Reynolds and John Alderley were elected into the places of William Reynolds and John Lees by the minister and church-wardens. Elsewhere, galleries were provided by wealthier donors, such as John Ford at Offwell in Devon (who was patron of the living). 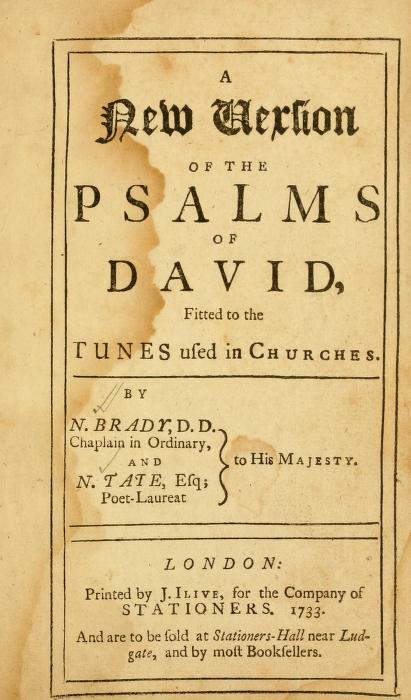 The choirs in both parishes would have been singing metrical psalms, perhaps using Nahum Tate and Nicholas Brady’s New Version of the Psalms of David (1696), which drew on Thomas Sternhold and John Hopkins’ Whole Book of Psalms in English Metre, published in 1562 and still in use over a century later. Like most Georgian galleries, the one at Gnosall would have been destroyed by the Victorians. The gallery at Offwell, which was at the west end of the church, was built in 1754 and removed exactly a century later. The loft at Gnosall, if it survived until 1820, would then have been swept away in the major rebuilding of the church which took place in that year.